Asor-gota (microcos paniculata, family: tiliaceae) is a small to medium-sized tree, sometimes shrubby in nature, with many branches. In Bangladesh it is found in the wilderness, specially in the hilly forest regions. Other Bangla names: Potka, Pichundi, Asor, Fottas, Datoi. Leaves are dark green (new leaves are shinny bronze) with conspicuous veins and midrib, alternate, short-petioled, oblong-lanceolate, slightly serrate, 10-20 cm long and 6-10 cm wide, apex acute. Flowers are small, yellowish white, long-peduncled, sepals 5, petals 5, clustered on terminal panicle. Flowers bloom in summer to autumn. Fruit is a berry, small, 1 cm in diameter, smooth, blackish. Flowers and fruits can be seen at a time on the tree. Propagation of the plant is caused by seeds. 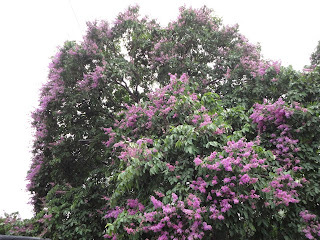 Flowers and leaves are used in cough, indigestion and skin diseases. Village children play with its fruits as the bullet of Bamboo-made toy gun.